Imagination Playground | Creative play products | KaBOOM! A playspace concept that delivers unique, cooperative play opportunities that can be instantly activated anywhere, anytime. 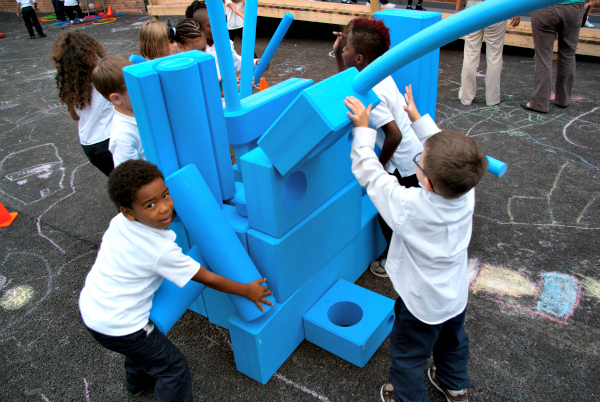 Imagination Playground™, a breakthrough playspace system created by architect David Rockwell for Imagination Playground LLC, uses uniquely shaped foam blocks and loose parts to empower children to design their own course of play. Each set contains a wide variety of parts: cubes, bricks, cogs, curves and cylinders. The loose parts have holes and shapes that fit together in ways that allow the continuation of a child's idea. A pair becomes a wall. A wall becomes a room. A room becomes a house. The pieces fit together to make immersive play last a long time. 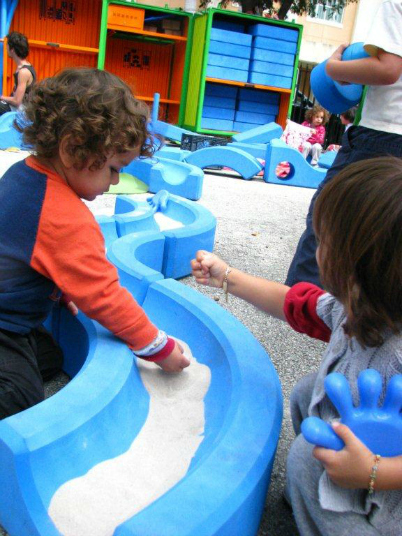 The Imagination Playground™ encourages creativity, communication, and collaboration in play. Children play most creatively in settings they can manipulate. Sand and water, for example, serve as raw materials for creativity and sensory exploration. Imagination Playground™ provides a transformable environment that allows for many types of activities, empowering children to influence the space around them. A wide array of movable objects allows each play session to become a new experience. With Imagination Playground™ Loose Parts, children can create their own narratives and games; build something and tear it down; or simply play to enjoy shapes and textures. Play Associates provide an open setting in which children can direct their own play. These trained adults allow play activity to evolve by maintaining a safe and secure environment, and by renewing and varying the supply of Loose Parts. Their job is to ensure a diverse, creative play space. 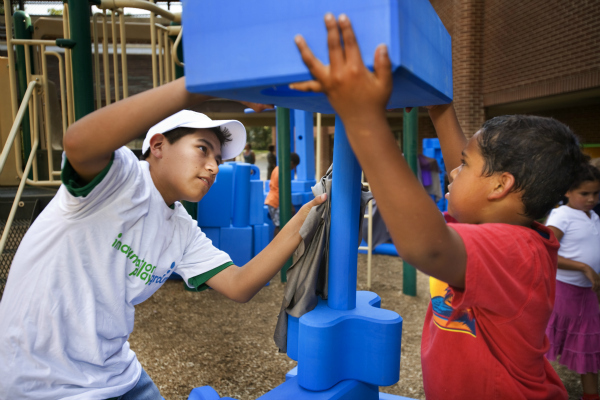 Learn more about playing with the Imagination Playground™. Imagination Playground™ provides an innovative play opportunity that can be instantly activated anywhere, anytime. We've hosted Imagination Playground™ sessions at schools, community centers, museums, public parks, street fairs, and even office settings. The possibilities are endless! Watch the video above to see the power of Imagination Playground™ and check out our answers to frequently asked questions.